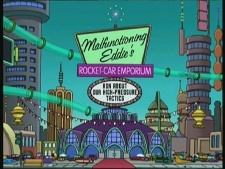 Malfunctioning Eddie's Rocket Car Emporium is a business selling luxury hovercars, including the Thundercougarfalconbird. They claim their prices are low because of Eddie's malfunctions, but this claim is not supported by the hard-sell tactics of their sales staff, particularly Victor. In 3001, they were promoted by an ad featuring former US presidents Washington and Lincoln. Malfunctioning Eddie, the business owner, spent some time in 3003 at the HAL Institute for his apparent malfunctioning. It is unknown who ran the business in the meantime, but Victor visited him at the institute. The Thundercougarfalconbird is one of the cars sold in the store. This page was last edited on 3 August 2014, at 21:11.